Townhomes & garden apartments on the water make Huntington Lakes a perfect choice for families, professionals and those looking for apartments that feel like home. We offer one, two and three bedroom floor plans in northwest Gainesville, with townhouse or garage options and water views. Large portrait windows and spacious floor plans make our waterfront apartments the most luxurious flats in their class. Choose from many different floorplans and enjoy vaulted ceilings and built-in shelves. 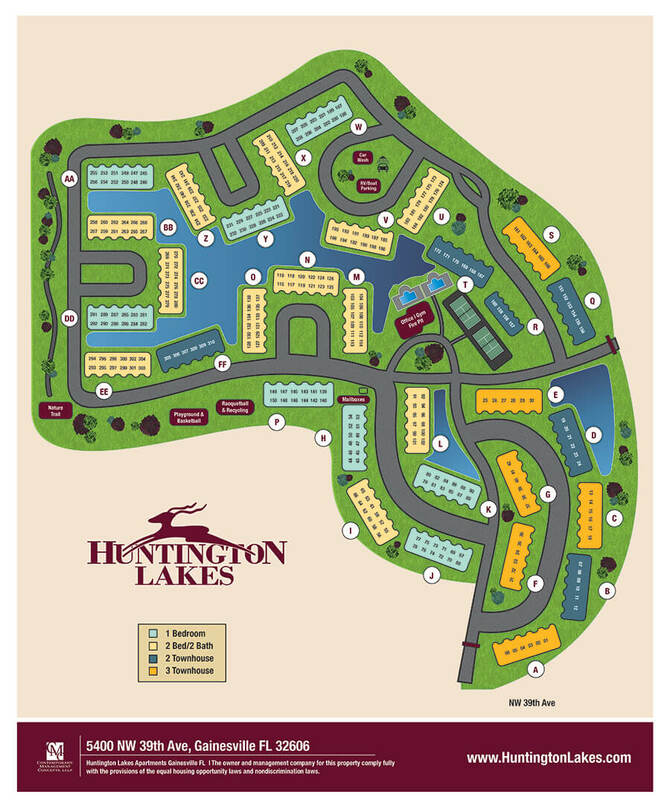 Huntington Lakes is in a prime location surrounded by the best schools in town and easy access to I-75. Are you looking for apartments or townhomes in Gainesville that stand out from the rest? If so, make Huntington Lakes your next home. Our extensive list of amenities can enable you to have a well-rounded life that is both exciting and healthy. With swimming pools, tennis courts, and a basketball court, life at your new family apartments in Gainesville will never be boring. Our 2-bedroom apartments boast private bathrooms, a full-size kitchen, and living and dining roms that make it perfect for roommates or small families. Get the feeling of ultimate comfort and privacy in our two-story apartment that overlooks beautifully landscaped lakes and gardens. You’ll have to see these truly beautiful apartments for yourself to believe it. LIVE MINUTES FROM THE CITY AND CLOSE TO THE LAKES - YOU'LL FEEL RIGHT AT HOME IN NORTHWEST GAINESVILLE! While you are searching for the best luxury apartments Gainesville, FL, has to offer, be sure to consider Huntington Lakes. We are only minutes from the city and are surrounded by eateries and groceries stores. Huntington Lakes is also only one mile away from the well-known Devil’s Millhopper Geological State Park.